A .dvdmedia file is a bundle that holds the contents of a VIDEO_TS folder with .dvdmedia extension. As a program used to make digital backups of DVDs, it contains audio and video files ripped from a DVD. The .dvdmedia extension only exists on Mac OS and the DVD player application on Mac OS can play a .dvdmedia file directly. How to Play .dvdmedia file on iPhone, iPad and Android and more? As it's a trend in life to enjoy movies on the go with portable devices such as iPhone 7/6S, iPad Pro, iPad mini, Samsung Galaxy Note 7, Amazon Fire Phone, Google Nexus 8 etc, you will want to play dvdmedia files on those devices, but only to find dvdmedia is not playable. This is exact the same situation as thousands of other users who have a bunch of .dvdmedia files and can't open or play them on portable devices. You therefore need a DVD ripper for Mac or Windows to convert dvdmedia to some widely accepted format like convert dvdmedia to mp4 Mac as the latter is one of the most common video format with relative high quality. There are many video converters that can run video conversion greatly, but the .dvdmedia extension is throwing them all for a loop. For the sake of saving your time and hassle, it's highly recommended to use a DVD ripper named MacX DVD Ripper Pro. You can convert dvdmedia files to MP4 as well as various other popular formats like MOV, MKV, FLV, AVI, WMV, etc on Mac OS X. In fact, this best DVD ripper for Mac can enable you not only rip dvdmedia to MP4, but also copy ISO as well as rip DVD to MP4, MOV, MKV, FLV, AVI, WMV, etc for playback on various kinds of portable devices, including iPhone X, iPad Air 2, iPad Mini 4, iPad Pro, Samsung Galaxy S8, Amazon Fire Phone, Google Nexus 8, PS4, Xbox One, etc with excellent quality. Download this top DVD converter for Mac and install it. Insert the DVD disc into your drive and open it. Add your .dvdmedia files to the program by clicking Load DVD button. 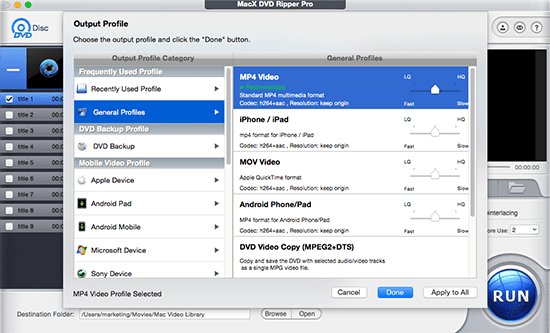 Select MP4 as the output format in order to convert dvdmedia file to MP4 on macOS. Simply go "Mac General Video" and choose "MP4 Video" as output format. Hit the "RUN" to start converting dvdmedia to MP4 on Mac. Once it is finished, you can import it to iPhone, iPad, Android, PSP, etc for playback anywhere anytime. Besides converting dvdmedia to MP4 on Mac, this Mac DVD ripper constantly upgrades to support to rip the latest new DVD movies with copy protections on Mac, you can freely rip any latest movies published by Disney, Warner, Paramount etc. By the way, please respect the local copyright law before dvdmedia files ripping. And keep your converted dvdmedia file in fair use as well. After you convert your dvdmedia files to MP4, there is one more step to finally play dvdmedia files on iPhone iPad. MacX MediaTrans is to the point for this purpose. It could help you to transfer the MP4 videos converted from dvdmedia files to iPhone iPad seamlessly. Actually, not only MP4 format videos, but also MKV, MOV, AVI, FLV as well as the dvdmedia files can be transferred from Mac to iPhone iPad without any hassle on format incompitiblity. Wondering to rip Video_TS to MP4 format for convenient playback? Your search will end here as a solid DVD ripper is introduced for you to copy DVD Video_TS folder to MP4, AVI, WMV, MOV, MKV, etc. Top OS X DVD ripper review-pick out the best DVD ripper for Mac to decrypt and rip DVD to Mac, USB, iPhone iPad, Android with high quality and ultra fast speed. Converting VHS to MP4 digital formats can be a daunting task. But you can follow the guide to convert VHS to MP4 with MacX in just two parts.